It sounds like you put one huge light in front of your house and, boom! Your home is blasted with a flood of stark light. Grab your sunglasses and kiss any of the beautiful details of your home’s architecture goodbye. The sad thing is, that’s exactly what some homeowners do. Like any aspect of good professional landscape lighting, there’s an art to this type of lighting. Let’s take a look at how to properly floodlight your house. Floodlighting is a basic element of landscape lighting. When floodlighting a house, lights are placed low in the landscape and directed up at your house. They cast a wide beam to offer a wash of light that highlights the architectural features of your home. The idea is to bring inviting warmth to the front of your house. This is your curb appeal lighting, to be appreciated from the street. But it serves other purposes, too, including security lighting, as well as accent lighting for your home’s unique features. But it isn’t meant to stand alone. The best home floodlighting is combined with other layers for an entire palette of light. We might start with lighting your front entry. But we don’t stop there. The goal is balance and composition, so we’d add washes of light across the front of your home, so the light gently carries your eye across the entire front of the house. Layering is important — not just flooding the dormers and the chimney with light. We look at the architectural features you want to highlight, and bathe them in light. Maybe your nice dark brick facade, or stone work, or heavy timber gables. Each gets a soft wash of light so the eye sees and appreciates each portion of your home. Other layers of light that work in harmony with floodlighting are path lighting along your walkways and up your steps. Uplighting that stand of pine trees and your pretty red bud tree. Downlighting your flower beds, so it all looks bathed in moonlight. We might light the columns on the front of your home, and those striking timber gables 20 feet away, but what about the spots in between? A lateral floodlight is perfect for those in-between spots, so they don’t disappear in the dark. We use narrower beam spreads to highlight the vertical features of your home, and wider beam spreads for the horizontal features. We might break out one of the tricks of our trade — a “spread lens.” This accessory affixes to the front of the bulb to spread out the light. With floodlighting, the bulbs do the heavy work. The fixtures are there to house the bulbs. But there’s some finesse involved in choosing the right fixtures. You want aesthetically pleasing fixtures that fit the space. We’d likely choose a lateral wash light fixture for your home’s floodlighting, rather than a bullet fixture. A bullet fixture — shaped like, you guessed it, a bullet — is better designed to shoot light up into a tree. A lateral wash fixture has a softer oval shape suited for aiming a wide, 120-degree spread of light toward your house. We also choose fixtures that will blend and hide best in the landscape. You may have heard me say this before: you want to see the light, not the source. And we take your lifestyle into account when we select fixtures for your home’s unique lighting needs. Is the space a high traffic area? Do you have lots of kids? Lots of parties? Teens ducking in and out? Then we might use in-ground floodlights that are flush with the ground so they aren’t trampled. The advent of LED lighting means we can get away with smaller, less obtrusive fixtures for floodlighting, just one more advantage to the beauty of LED landscape lighting. A new home with new landscaping needs different lighting treatment than an established home with mature trees. If you have a new startup tree, we can put a single lamp on it with a 2-watt bulb that offers a nice soft beam spread. The light won’t overwhelm it. Then, in eight years or so, when the tree is three times bigger, we can switch the bulb for a 5-watt lamp, or add a second fixture if needed. Your lighting system can grow as your landscape changes. If you want your house to look like it belongs on the Las Vegas strip, by all means, go for it. But if you want elegant, tasteful, artistic floodlighting for your house, you can’t just grab four 150-watt floodlights from the big box store and line them up, soldier style, in front of your house. That just aims a stark blast of light at your home that washes out all the nice architectural features that makes your house unique. This is where professional expertise comes in. Skilled lighting artisans have the know-how and acumen to choose the right blend of lighting to subtly wash your home with light, not flood it beyond recognition. Sure, I could put a 400-watt light on a pole on top of your house and light your whole front yard. But it’s not a parking lot. We’re trying to create atmosphere, and it takes a lot of different pieces, working together, to do that. 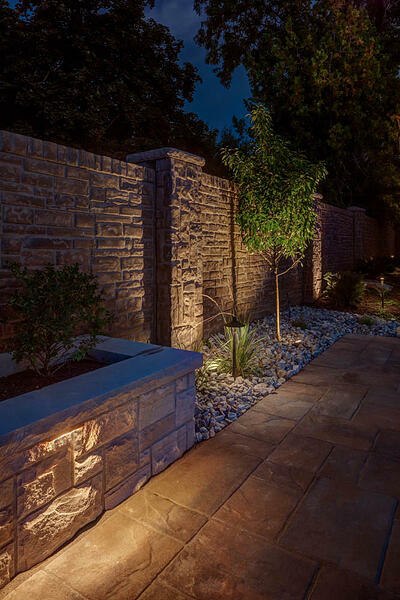 To learn more about how artistic, skilled floodlighting can beautify your home and landscape, call us at (801) 440-7647 to schedule a free consultation, or fill out our simple contact form. 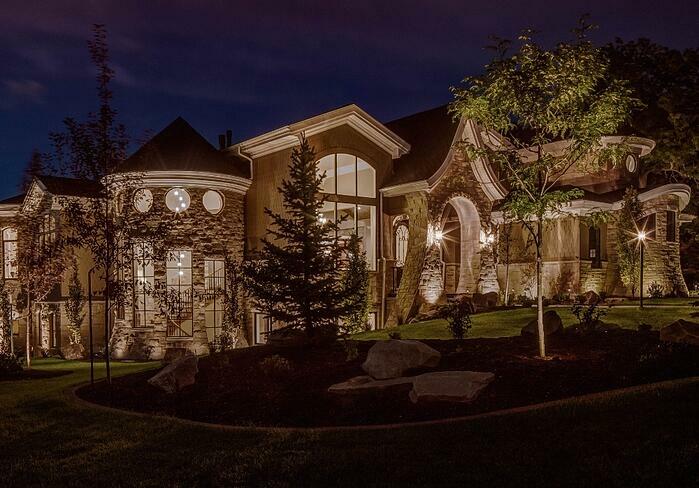 Located in Midvale, Landscape Lighting Pro of Utah serves customers throughout Utah’s residential areas, including Salt Lake City, Park City, Draper and Holladay. 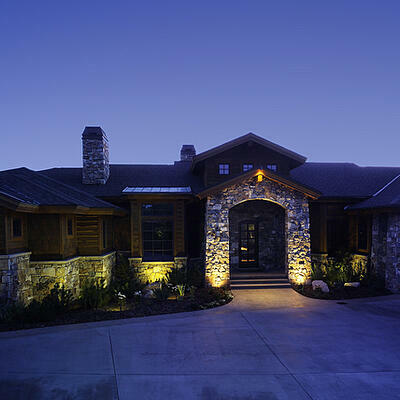 Our outdoor lighting portfolio includes projects from Salt Lake County and Utah County, to Davis County and Summit County — and beyond.